Economics is the study of decisions—the incentives that lead to them, and the consequences from them—as they relate to production, distribution, and consumption of goods and services when resources are limited and have alternative uses. CDC uses economics to identify, measure, value, and compare the costs and consequences of alternative prevention strategies. 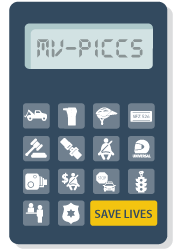 MV PICCS—the Motor Vehicle Prioritizing Interventions and Cost Calculator for States—can help states select from a suite of 14 effective motor vehicle injury prevention interventions. It calculates the expected number and cost of injuries prevented, lives saved, and costs of implementation, taking into account available resources. Cost analysis of intervention/program, side effects, and illness. CDC economists have explored the costs of cancers, hospital-acquired infections, communicable diseases, and even an outbreak investigation for local health departments. Economic evaluation for comparing two or more interventions/programs in terms of costs or benefits; evaluations include cost-effectiveness, cost-benefit, and cost-utility analyses. CDC economists performed evaluations on screening options for diabetes, diagnostic options for HIV and TB, vaccine strategies, and injury prevention programs. Decision and transmission modeling includes developing and testing regression models, Markov decision-choice models, agent-based models, simulations, and theoretical mathematical models. CDC economists have performed modeling on vaccine strategies, HIV diagnosis and treatment, and state public health resource-allocation options. Regulatory impact analysis for anticipating and evaluating the impact of regulations on costs and/or behaviors. CDC economists’ work in this area includes analyzing the effect of required pre-travel medical consultation for international travelers. Budget impact analysis (BIA) for estimating the financial consequences of adopting a new intervention for local, regional, and national budgets. A BIA is usually performed in addition to a cost-effectiveness analysis to provide a comprehensive economic assessment of a new policy or programmatic intervention. Health impact assessment (HIA) for bringing together scientific data, public health expertise, and stakeholder input to identify the potential health effects of a proposed policy, plan, program, or project. An HIA offers practical recommendations for ways to minimize risks and capitalize on opportunities to improve health. The following tools can be used to evaluate the costs and burden of various health problems and the effectiveness and efficiency of health programs. The tools were created by CDC and its partners. Provides the basics of why and how to conduct economic evaluation to complement a state asthma program’s overall evaluation activities, including the considerations involved in planning and implementation. Provides an overview of the tensions that exist when laws or regulations restrict activities harmful to health, with trade-offs required between the good of the whole community versus the good of an individual. For example, wearing a helmet substantially decreases a motorcyclist’s risk of death and the associated costs, yet legislation mandating helmets can be considered a restriction of freedom of choice. Allows community programs to assess their own performance and use the data to leverage resources for their sustainability. Also translates project-specific impacts into community-wide effects, including any new health and community services provided, number of jobs created, wages earned, and overall impact on the economy. Describes the strengths and weaknesses of checklists that have been used to evaluate best practices for conducting and reporting on economic evaluations in healthcare. Identifies well-developed checklists for use by investigators, reviewers, and journal editors to ensure that economic evaluations and their systematic reviews will be informative and transparent. Designed to help public health departments estimate the economic returns from investments made in strategies that enhance public health service delivery, including quality improvement interventions. To use the tool, you’ll need to create a free account; for detailed instructions, use the ROI Tool Instructional GuideExternal. Describes updated guidance on methods for performing a Budget Impact Analysis. This report of the ISPOR 2012 Budget Impact Analysis Good Practice II Task Force was published in Value in Health in 2014. Provides practical guidance on using regulatory impact analysis as a way of improving regulatory quality and, as a result, government effectiveness and efficiency. Offers guidance to officials in the public and private sectors on conducting health impact assessments to evaluate public health consequences of proposed decisions, and suggests actions that could minimize adverse health impacts and optimize beneficial ones. Translates the values underlying health impact assessments (HIAs), along with key lessons from HIA practice into specific “standards for practice” for each phase of the HIA process. Simulates the spread of influenza through a model community and assesses the impact of a variety of potential interventions (e.g., vaccinations, school closings, wearing of facemasks, patient and household isolation/self-quarantine). Also provides estimates for the numbers of cases, hospitalizations, and deaths that might be seen among different age groups in a representative community. Allows users to estimate the economic impact, in terms of days of work lost, of an influenza epidemic/pandemic in a community, calculating the savings and costs associated with one or more interventions. Helps state- and local-level planners prepare for the next influenza pandemic by providing estimates of the potential impact specific to their locality, including deaths, hospitalizations, and outpatient visits due to pandemic influenza. Helps laboratory directors estimate the demand for specimen testing during an influenza pandemic, and helps public health planners develop pandemic response plans. Estimates the daily number of specimens that may be delivered to a lab for testing and evaluates the testing capacity of a specific lab (e.g., how many samples can be tested per day or work shift) per pandemic transitional day found in each of the pandemic stages. Introduces the concepts used by economists in in studying how laws, regulations, and other policies can address market failures in order to improve public health. These tools assist with planning large-scale smallpox vaccination clinics with maximum patient flow-through. Users can select the number and type of professional resources available to operate a clinic (e.g., physicians, nurses), and the software will allocate those staff, optimizing clinic operations.